Pittsfield Historical Society | Preserving Pittsfield for its future! PHS museum located at 13 Elm St. 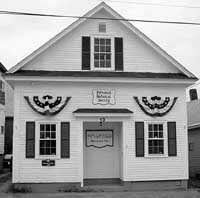 The Pittsfield Historical Society was founded in 1971 and is presently located at 13 Elm Street, Pittsfield, NH. We are open to the public every Tuesday from 9:00 am to 12:00 pm for visitors to view our collections or ask questions. Our telephone number is 603-435-8004, and you may leave a message on our answering machine at any time. We will return your call when our staff is present, on Tuesday morning. Please become a member or volunteer to help preserve Pittsfield’s history. The Pittsfield Historical Society is a New Hampshire, 501(c)(3) charitable corporation. 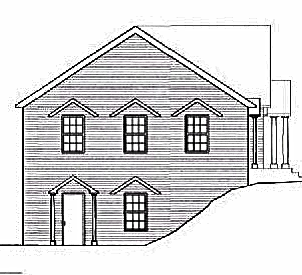 The Pittsfield Historical Society has purchased the old Washington Hotel Lot at the top of Factory Hill and will be erecting a new building beginning in the spring of 2019. It will be 30′ x 80′ with two stories and be able to house all of its artifacts currently stored in several places around town. Below are renderings of the building. There will be a cupola on top not shown on the diagrams. The need is great. Presently, archives space is overflowing with documents, pictures, newspapers and other ephemera. For one person to move from one corner of the room to another, two or three of the volunteers must stand up and move aside. Moreover, there is not a sufficient number of desks to accommodate all of the volunteers. The museum is so jam packed with artifacts that it difficult to distinguish one item from another. Many items are stacked on top of display cases for lack of any other place to put them and are susceptible to being stolen. Further, there is no storage space in the building. The attic is inaccessible and the basement has a dirt floor and is damp. Finally, the Society has historic items stored throughout town, some in places where they are deteriorating because of existing conditions. The new building will house all of these items. Among them are an 1876 fire wagon, an 1895 hose and reel, a baggage cart from the old railroad station, an historic piano, and artifacts in two tractor trailers and a basement. Pittsfield Historical Society’s mission is to educate the public about the significance of Pittsfield’s past and its relevance and relationship to the lives of the citizens of Pittsfield today. In support of this mission, the Society collects, preserves and interprets materials pertaining to Pittsfield’s history.